Ryan Hardesty, curator of arts and exhibitions at WSU's new museum. 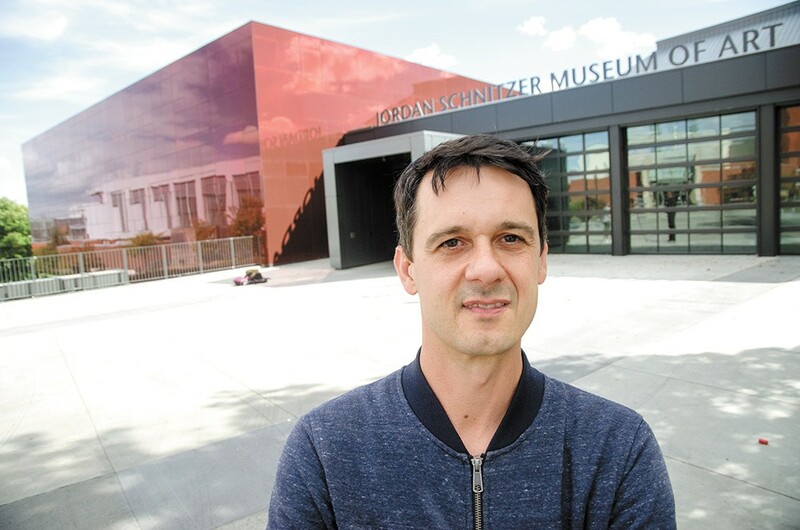 As a curator, the opening of the new Jordan Schnitzer Museum of Art on the Washington State University campus obviously excited Ryan Hardesty. Rather than one midsized gallery tasked with handling any kind of show Hardesty and his peers wanted to present, they now had six galleries of varying sizes to play with, a total of nearly 15,000 square feet, plus the old space. Instead of programming exhibits and having to choose either/or, they could plan for this, that and the other. "It's changed everything," Hardesty says. Now curator of arts and exhibitions at WSU, Hardesty previously spent a dozen years at Spokane's Northwest Museum of Arts & Culture. "We've gone from a museum that had one gallery and one show at a time — and we had maybe five exhibitions every academic year — to having six distinct spaces. From a curator's perspective, I'm really thrilled with the opportunity to work on everything from a full-fledged retrospective survey exhibition to more intimate, project-based shows in some of the smaller gallery spaces. Frankly, that's something we didn't have previously." Before opening, the new museum anticipated about 20,000 visitors a year, and they've already reached 9,000 since the April opening weekend. That party brought dignitaries and donors from throughout the region to a celebration of what's already been affectionately dubbed the "Crimson Cube" for the museum's reflective red panels covering the exterior. It's a touch that architect Jim Olson said was designed to "reflect the world outside" while giving the students "the opportunity to see themselves in the building," literally. Hopefully, he added, that will give them "a little creative spark they didn't have before." For Jordan Schnitzer, inspiration is the name of the game. He's an art evangelist with a potent message and manic energy that was on full display as he led visitors on a tour at the grand opening, describing the history of some of his own collection displayed during the museum's first few months. The Oregon-based real estate magnate has spent his life collecting, and sharing, a stunning array of contemporary artworks. He donated $5 million toward the $15 million needed for the new WSU museum that bears his name — the rest came through private donations, WSU and the state of Washington — and he's similarly supported museums at the University of Oregon and Portland State University. Schnitzer says a university, particularly a rural campus like WSU, is the perfect place for the arts to make a huge impact on its students and the surrounding communities. Students might be going to Pullman to train themselves for jobs in fields ranging from engineering to veterinary science, but he hopes they'll go home with their eyes open to new ideas thanks to the museum. "I believe artists for time immemorial have been the prophets of our time," Schnitzer said on opening day. "They're always the ones that are forcing us to deal with issues in society, whether we're talking about Egyptian times or medieval times, it doesn't matter. Just like the editorial writer in the New York Times, they're putting up on the wall sculpture, paintings, whatever art form, issues that are important for us to focus on. And what better place for us to deal with issues of our time than a university campus?" WSU President Kirk Schulz agreed, noting that he hopes the museum will be seen as a regional artistic center. And while the campus community will obviously be the most likely to interact with the museum on a daily basis, the museum will continue reaching out to the surrounding communities. "You come to a museum like this and you see some different things you've never thought of, and it challenges you in different ways," Schulz said. "I think then you get back in the car and drive home and we've changed, just a little bit, the worldview of people who have come through here." That can even happen with people who are in the museum every day. While Hardesty says it's great to visit the new galleries and see people perusing the collections, he's also found himself drawn to one particular exhibit in the museum that continues through this school year. The Crow's Shadow Institute of the Arts on the Confederated Tribes of the Umatilla Indian Reservation in Eastern Oregon is perhaps the only professional printmaking studio on a reservation. There are 75 prints by both Native and non-Native artists in this traveling exhibit curated by the Hallie Ford Museum of Art. "When it came across my desk, we jumped at it," Hardesty says. "It's an institution and collection I've been aware of for 10 years or more, and something I knew at some point I wanted to have the chance to show." The New York-based Gilmore blends nine performance-based videos and live performance in a show that Hardesty says would have been difficult to pull off when WSU only had one gallery to work with. WSU alum Sean Elwood has been donating art to his alma mater since the late '80s, more than 300 pieces in total that are part of WSU's permanent collection. "We knew when we were opening this new facility with some larger galleries that there'd be this opportunity to celebrate works of art that we hold in public trust in our permanent collection," Hardesty says. "The Sean Elwood Collection is just that." Seattle-based and German-born composer and sculptor (who only goes by his last name) Trimpin designed this installation of 12 motion-activated horns playing tones that change with every visitor and every movement. Six room-sized projections from six international artists working in video and photography assembled by Seattle-based collectors William and Ruth True. Three WSU faculty members address the central theme of the "formation of identity or personhood in contemporary society," Hardesty says, adding that the show "represents an ongoing relationship we have with fine arts faculty on campus." The original print version of this article was headlined "Major Upgrade"